A Slice of Smith Life: Camping, Vomiting, and Fun All at the Same Time! My Fall and blog break was short, fun, and full of adventure! This was our home sweet home while camping, my in-laws camper. In the past, we pitched our tent on their property on the gravel, but this time it was a blessing to stay indoors while my poor hubby got over his sickness. On Friday morning, my hubby felt weak, but was able to hold down water and some food so we were off to explore the sites about 30 minutes away from our camp site. We went to visit Little Switzerland, NC. Near our campsite, we travel past this beautiful big lake with mountains and houses tucked into the trees. The reflection of the mountains on the water is awesome! As we drove closer to Little Switzerland we saw some tree farms on the side of the road. "Oh, Christmas tree! Oh, Christmas tree!" We finally made it to Emerald Village in Little Switzerland, NC where we explored the NC Mining Museum where the historic Bon Ami Mine is located. Our kids enjoyed eating their rock candy while we walked through the mine museum. The mine is behind us in this photo. We are walking in the mine here. It was like a big cave with lots of mine equipment and tools. The black line on the wall is where the water level used to be before they started the preservation process and museum. After we explored the Bon Ami mine, we went across the street to find gems at the Gemstone Mine. Our kids always enjoy gemstone mining where they get to keep what they find! We got a 5 lb. bucket of ore, put them into square pans with a mesh net and then we put the pans into the cool water flumes where the kids found some of the 52 gems and minerals that are mined in this area. The kids show off the gems they found! It was during this part of our day that our littlest one started emptying her stomach contents and she wasn't feeling well so my hubby and her are resting while I attended to our other children. Cupcake #4 eventually felt better later in the evening, but we were not sure if we should cut our trip short and head back home. We didn't know if all our family members would get the flu bug. We decided to stay, hoping for the best. In the evenings we lit campfires and roasted marshmallows and made S'mores. This is always a peaceful time with my family as I sit holding our sick one and rest my eyes praying that no one else in our family will get sick! We make it through the night with no one getting sick. Praise God! Although, our 10 year old did wake me up to tell me she was cold and her tummy hurt! Oh no! But, everyone was fine and we were off to meet my brother-in-law and his family at an apple orchard about an hour away from where we were camping. We went to Grandad's Apples in Hendersonville, NC. We went through a huge corn maze to try to find 5 different markers. The corn field and maze is in the background just behind the white truck in the above photo. In this photo my hubby and a green marker are in the distance. Each of the 5 markers were names of different tractors. Here we found the International marker. Then at each marker, we hole punched our card until we punched all 5 tractor names. When we found all 5 we had to find our way out of the corn maze. It took us about 40 minutes to walk through the maze and find all 5 spots and to find our way out. My brother-in-law had his handy dandy Garmin to tell us which path we had taken. When we came out of the maze we saw that we made a tractor pattern! Cool! Cupcake #4, #1, and #3 have fun with the cutouts and my Cupcake #2 in the green shirt in the background observes the llama. What a fun, adventuresome weekend we had with our family! It was definitely memorable for not exactly the best reasons, but we were all together enjoying this Fall season and for this I am thankful! PS: Happy 10-10-10 day! I would give our trip a 10 out of 10, despite all its craziness! Oh no tummy bugs are not nice. It sure looks like you all made the best of it though. Looks like you had a great trip in spite of all the sickness!! It's fun to get away once in a while. Traveling with the bug is awful! Praise God there were moments that you all could enjoy, and especially that Mama didn't get sick. When Mama gets sick...the whole house can shut down! 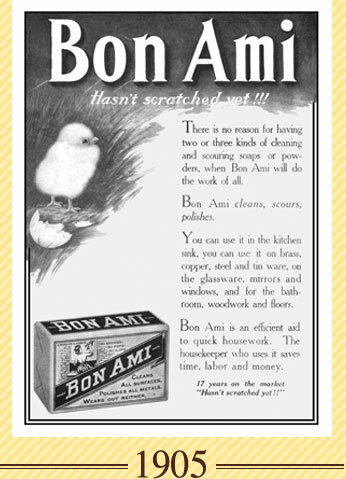 I forgot to mention, I have 6 cannisters of Bon Ami in my cupboard right now. I love their product, and have been using it for years. It was nice to see the old ad. The cannister has a little chick with the words, "Hasn't scratched yet!" I love this product. Thanks for your visit and comment. Yes, it is nice to get away, despite having to deal with things beyond our control like sickness. Thanks for your visit and comment! I just left a comment on one of your recent posts about Columbus Day! Thanks for your visit and I love your new blog background! Yes, my husband was very miserable, but he made the best of the situation to be positive around our kids even when he was not feeling well. His positive attitude...one of the many reasons I love the man :) So you noticed I switched my sidebar pics of the kids? Very observant! I took these photos on our trip in the mountains. You know I didn't think to buy the Bon Ami product when I was there! Now I wish I had! Can you get it in any store? Where do you get yours? I'll have to try it sometime since it does seem good for cleaning. My mom told me that my grandmother used to use it when she was living. Glad you were able to share the award with so many great blogs! The mountains are becoming a nice getaway place for our family too! I look forward to when we can go there again! Have a healthy and blessed week yourself ! I'm so glad you have been well since I have been worried that you might catch this nasty stomach flu even after taking as many precautions as we did with your visit! Gem mining is alot of fun. I hope with all your travels you'll be able to visit one! Absolutely beautiful pics- except for the one with poor Anthony laid out! I've never seen him like that. Looks like you all had a great time- I would love to make it up there one day. I just saw your comment here when I was going through old blog posts :) I hope you get to the NC mountains someday, they are beautiful and fun! It looks like you had a wonderful time despite the sickness! These fun trips combined with sickness definitely make them unforgettable! :) Thanks for sharing the link! It was a fun trip despite the sick stomachs. It was definitely memorable as well! :) Thanks for stopping over to visit and comment!